Etching on laid paper with a watermark "SE & Co 1817". Signed in pencil and signed and inscribed in the plate and dated 1877. 7 1/2 x 5 1/4 inches. The London portrait, landscape, genre and architectural painter and etcher Percy Thomas was the son of Sergeant Ralph Thomas. He had a brother Edmund who was a print dealer and publisher at 39 Old Bond Street in London. Percy studied under Whistler, Augusta Delatre and at the Royal Academy Schools. 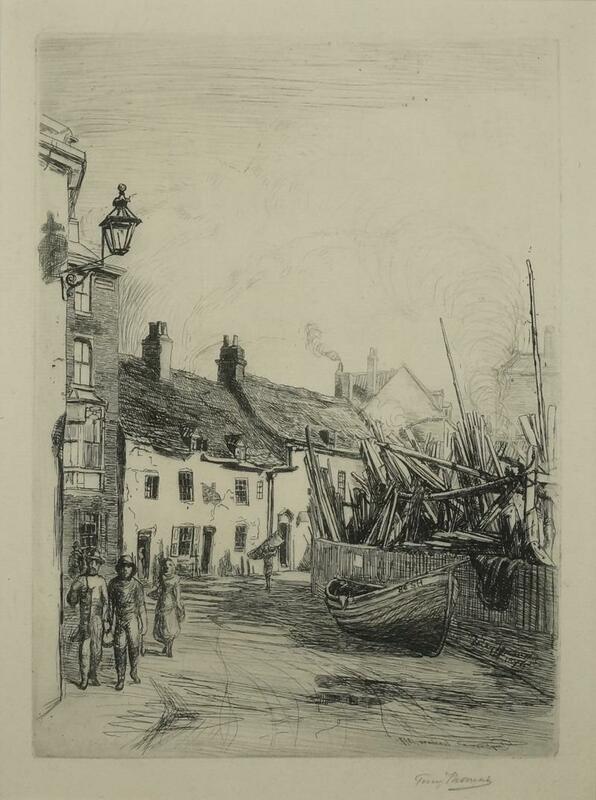 He was elected a member of Royal Society of Painter-Etchers and Engravers in 1881. In 1874 Percy Thomas etched Whistler's Arrangement in Grey: Portrait of the Painter for the frontispiece of the first catalogue of Whistler's etchings, published by his brother Ralph. He exhibited in London at the Royal Academy, Royal Society of British Artists, Royal Society of Painter-Etchers and Engravers and in Liverpool at the Walker Art Gallery.